I have a new favorite burl. It’s too bad that today is the last day I’ll get to work with it. That burl is Khamphi Rosewood Burl. Oh my DAMN this stuff is beautiful. The crazy swirls in the burl pattern, and the contrast between the heart and sapwoods, be still my heart. Even the bug holes are perfectly preserved. Khamphi Rosewood is exceedingly rare on my side of the world and the burls just aren’t available. It was pure luck that I happened across this burl as one of our Kickstarter backers pointed it out to us. This is by far and away the most striking burl I’ve ever worked with. I want to keep all the dice we made from it. Alas, that will not be the case. Here we have nine scratch that, I’m keeping the one in the back, eight burl d20s awaiting their turn in the laser engraver. 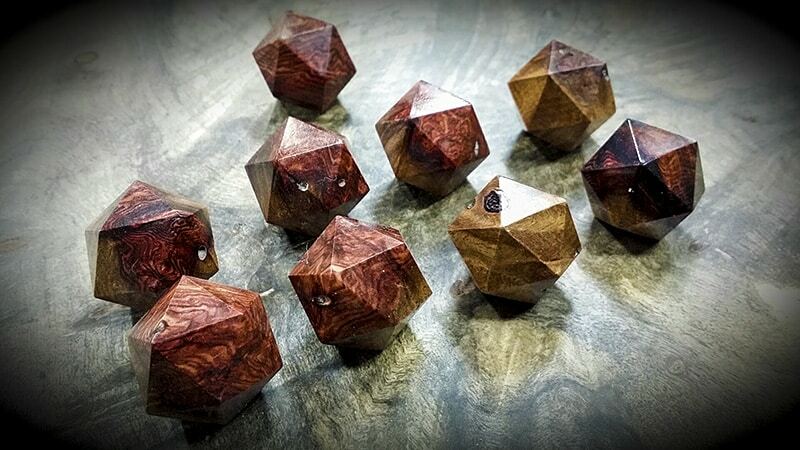 Since this is Cyber Monday you get to pick exactly which one of these d20s we’ll be shipping to you. They are numbered Top Left (Number One) to Bottom Right (Number Eight). Each one of these dice has had each face hand polished and buffed to silky smooth finish with a hard carnuba wax. These are seriously beautiful dice. I keep finding the Fluffy Minion in the corner petting them and repeating “My precsiouses” over and over.